The rug is a rich orange and very soft. As others have mentioned it is prone to snags and doesn't stay put, but those things don't really bother me. I'm a little worried it's too delicate to vacuum, but we'll see how that goes! I did not find it as dizzying as others did. 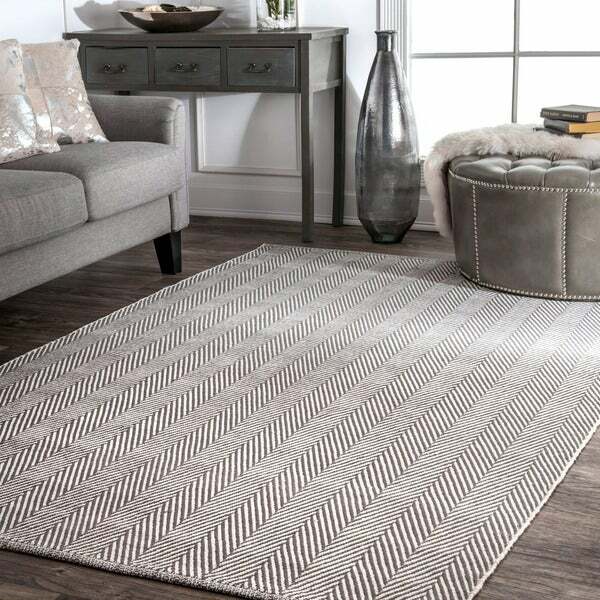 Tie any room together with this beautiful cotton area rug. 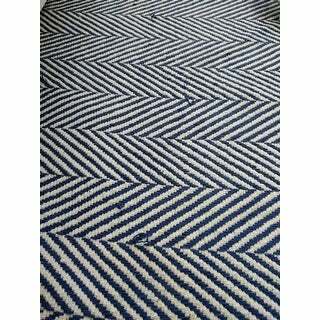 Featuring a contemporary chevron design, the rug tastefully blends with or adds a bold splash of color to your decor. The soft cotton is comfortable and plush underfoot. I was so excited to have this in my new blue and white dining room but the picture does not even come close to what the rug looks like. The picture makes the rug look more blue than white and I found it to be the opposite. The quality of the rug is not for a formal dining room. And, yes, it did hurt my eyes to look at the rug. 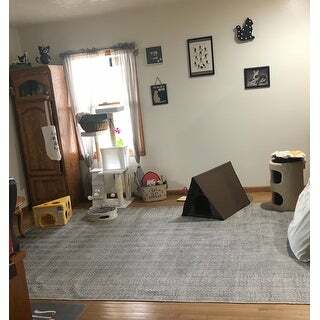 Unless you have it covered up at least 50% with other decor, it could make your eyes go nuts just trying to look at the rug. I returned this rug because both the ends of the rug were frayed. Love this rug, the color is darker than the photo. This is a Great rug! The color is perfect and was exactly as shown in photograph. The rug was very light and easy to manage. 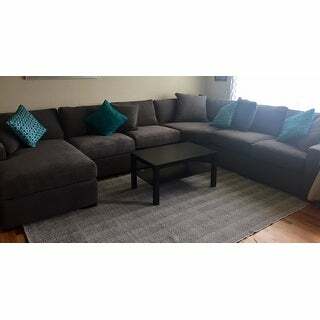 The rug is great quality and looks to be durable. I would highly recommend this rug. I love the way this rug looks, but unfortunately the strings have been pulled loose in multiple places causing loops to stick out (this has been cause by my dog's nails and furniture being moved over top the rug). This is pretty noticeable because of the pattern. However I still love the rug and think it adds a nice color/texture to my room. In order to solve for the loops, I "give the rug a hair cut" every-once-in-a-while which creates gaps in the pattern which I actually think adds a cool aesthetic. I am considering sewing in different color strings in the gaps to add more color. This is a cotton rug, so if you want something plush and soft-add a thick rug pad. I put this in my lake house dining room and I could not be happier. It is really cute and exactly what I was looking for. I liked the pattern of this rug, although I can see why others thought it was a little dizzying to look at. However, only one day after receiving it, my daughter spilled water on it. The blue immediately bled into the white and left a circle where the water spilled. I returned it the next day. This rug is very cute and comfortable with a thick pad under it. The busyness of the pattern made me dizzy until I got all of the furniture in it. This is the first cotton rug I ever purchased. I would not buy another cotton again. it was a pain trying to straighten is and get furniture organized on it. I like my wool rugs. The quality of rug is good. The color was more like a peach, not orange. Did not look like picture. My rug arrived with holes in the fabric/wool. Not cool. This rug pulled instantly. Hard to clean any stains out of. I actually washed this item in the washing machine and it did well. It is a cute rug. I really liked the look and feel of this rug but after the first vacuum (without using the brush roller, as instructed) it snagged in several places. This rug is clearly not durable enough if it didn't even last a week in our guest room, which gets nearly no foot traffic. Love this rug! There is more gray in this rug than the picture shows, but it looks gorgeous in my living room. It is thin, but durable and the price is extremely reasonable. We got this rug, and its nothing like the nice neutral color and pattern in the picture! Its not light grey, but almost black and white. The pattern is not subtle, it has very thick wide zig-zags. We returned it immediately! Cute rug that goes well with just about everything. 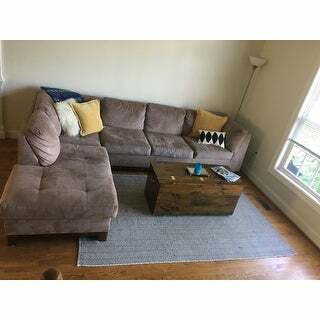 It does bunch up, and if you have furniture on it, it might pool around the feet. But, with a mattress pad I think that would solve it. This is a very good quality rug that lays flat otherwise. This rug arrived damaged. But the Overstock team was incredibly nice and accommodating regarding my return. In general, I wouldn’t recommend buying cotton rugs. They don’t hold up over time and fray easily. They also get dirty very easily and it is difficult to steam clean them and actually have them look better. It is easier and almost as cheap to just buy a new one. But overall I would NOT buy a cotton rug again. I loved this rug for my son's nursery. The orange and white colors are bright and fun. I would caution that it's difficult to clean since it's a flatweave area rug and any stains are going to set in. Feels very flimsy. It’s not a regular sturdy rug. Looks kind of cheap. It could probably look nice when paired with the right decor and furniture in a house that is free of children and cats but it was the wrong choice for my living room where we are often eat drink and have animals running around. The fibers are starting to tear up and get loose and look ratty. Would only work in a low traffic area. Beautiful rug! The color was just as described. I thought it would be a little more “cushy” than it is, it’s actually more like a “ heavy blanket”. But for my purposes, it will be perfect. Really pretty, very pleased. The rug is beautiful and does not have the overspray of distressed or dirty look to it. The first time I vacuumed it though on a setting as not to damage it. I noticed several places where there are threads that were not completely tied off. Still is a wonderful rug but it needs a non slip pad as it siips a lot even with a large rug for a bedroom. Great design and perfect for a living room. "I have a dog that sheds. Does the rug holdup well with dogs? Easy to clean?" I have dogs too. It is more like a cotton shirt then a carpet. So the dog hair won't be embedded into the rug, but you also will see stains a lot easier. I love mine, cause I power wash it every few months because of dogs and kids. "Does the rug shed? " No, it's cotton and doesn't shed at all, especially compared to my wool rugs. New rugs shed initially as a general rule. We do not recommend washing this rug- we recommend spot cleaning with a damp rag for spots and stains, but professional cleaning is best for long term cleaning and any tougher stains and messes. "What are the care instructions for this rug?" We recommend spot cleaning with a damp rag for spots and stains. We do not recommend washing in a machine as they may loosen and warp the fibers. "Since it's cotton and has no backing, seems like it could be machine washable. Is it?" We recommend spot treating this rug when necessary. "is the color more navy or royal ?" "Is there any rubber backing at all? I am trying to find a jute type rug that is. I never can tell. " No rubber backing. I have this area rug on top of a wall to wall carpet in my den.